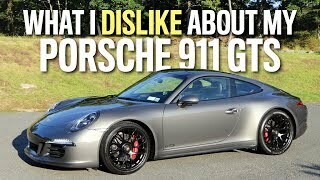 After the release of first Porsche GTS version in 2008, Porsche has been doing well in the GTS lineup by introducing AWD version in 2011. For the present year 2015 Porsche extends its GTS segment by introducing Porsche 911 Carrera GTS 2015. With the same 3.8 Liter six-cylinder engine 911 Carrera GTS 2015 has some unique features that make it stands a lap ahead. Let us have a look at them and see what all special features it brings with it. Interior of Porsche 911 Carrera GTS 2015 holds major resemblances from its 911 sibling. However few additions are noticed in the interior through Alcantara trim, leather-wrapped seats and satellite navigation. We on our front doesn’t find anything wrong in this carrying forward of interior features in 911 Carrera GTS but if you have any desire to make your GTS look bit different and special, Porsche has a massive line of options for you. Through which you can chose particularly that which and what in your cabin is to be changed how. Well this reminds of Porsche’s priceless (we mean expensive) Exclusive program with which you’ll have an entirely new designed cabin of your Porsche 911 Carrera GTS 2015. Exterior of Porsche 911 Carrera GTS 2015 will undoubtedly gain your attention in an instance through its wide track and most primarily flared rear wheel arches upon those 20” wheels in matte black with center locks that splatter aggression as you leave the boulevard. While the front fascia of 911 Carrera GTS 2015 gets some special trim elements and bi-xenon headlights rear fascia gets its special blend through exhaust-pipes in black chrome and air-intake screen below black trim strips. Rounding up the entire exterior looks, Porsche 911 Carrera GTS is an aggressive looking stylish new car you’d love to take a ride on. 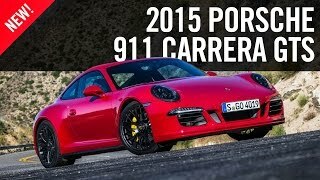 Porsche 911 Carrera GTS 2015 gets its power through a 3.8 Liter flat-six engine delivering 430hp and paired to either seven-speed manual transmission or a PDK transmission. Model comes with again an option for customers; they can have it in either rear wheel drive or all wheel drive mechanism. 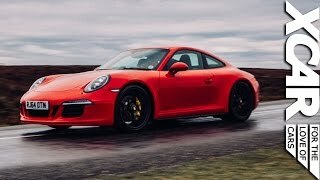 Sharing minor difference in the performance statistics the Porsche 911 Carrera GTS can sprint from 0-62 mph a little faster in 4.0 seconds, while its manual transmission sprint time stands at 4.4 seconds. 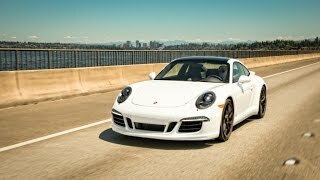 While top speed for Porsche 911 Carrera GTS with its Manual and PDK transmission combined with AWD system takes the ticker to a 190 mph and 189 mph respectively.